A journal of delicious, healthy and inexpensive meals made with love for the discriminating pack-luncher. Every year my friends put together a vegan thanksgiving meal. Most of the people who attend aren’t vegan, but we all love the challenge of making something delicious and vegan. 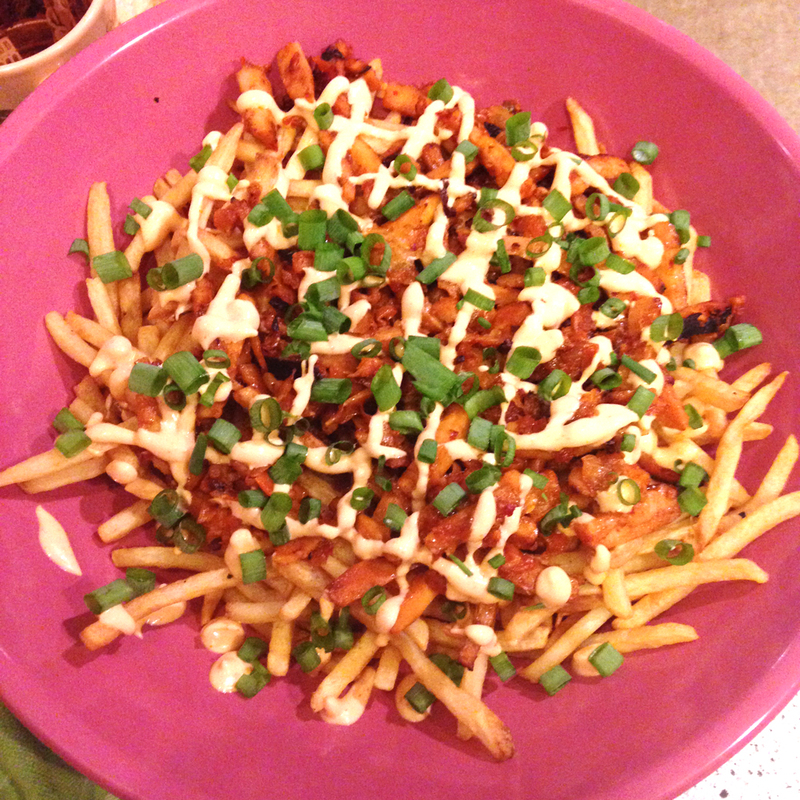 My contribution this year was vegan kimchi fries. I had a non-vegan version at a Japanese restaurant last year and it sort of stuck with me. This isn’t a lunch thing you would take to work, but man, it was tasty. Heat a sauté pan on medium-high and add oil. Sauté the kimchi for about 10 minutes. Add the meatless chicken and stir until heated through. Add the sauce from the meatless chicken package and stir for about 5 minutes. Turn off heat and set aside to let the flavours permeate. Cook the shoestring fries according to the package and put on a nice platter. Reheat the kimchi/chicken mix on the stove, cover the fries. Mix the vegan mayonnaise and and Sriracha to your preferred level of spiciness and flavour. Put in a ziplock bag. Cut off a small corner of the ziplock bag and drizzle over the dish. This dish was a big hit. I can’t wait to make it again with non-vegan options.